Light: Succulents prefer bright light, such as found on a south-facing window. Full sun outdoors in spring and summer are also preferred, but you must slowly acclimate your plant to full outdoor conditions. Temperature: Succulents are much more cold-tolerant than many people assume. As in the desert, where there is often a marked contrast between night and day, succulents thrive in colder nights, down to even 40ºF. Ideally, succulents prefer daytime temperatures between 70ºF and about 90ºF and nighttime temperatures between 50ºF and 55ºF. Overwatering: Overwatered plants are soft and discolored. The leaves may be yellow or white and lose their color. A plant in this condition may be beyond repair, but you can still remove it from its pot and inspect the roots. If they are brown and rotted, cut away dead roots and repot into drier potting media, or take a cutting and propagate the parent plant. Underwatering: Succulents prefer generous water during the growing season (spring and summer). An underwatered plant will first stop growing, then begin to shed leaves. Alternatively, the plant may develop brown spots on the leaves. 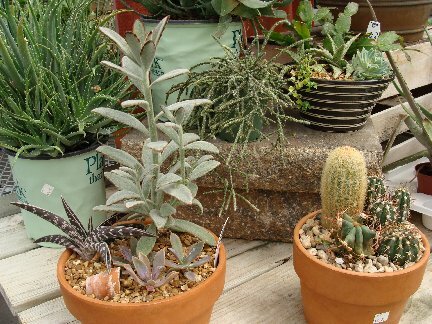 Potting Soils: Succulents should be potted in a fast-draining mixture that’s designed for cacti and succulents. Fertilizer: During the summer growing season, fertilizer as you would with other houseplants. Stop fertilizing entirely during the winter. 6 Responses to Succulents – Some Like it Hot! When I bring my succulents indoor for the winter, how often should they be watered indoors? Hi Ted, Thank you for your question. Depending on the size of the pot & the location, you should check them about every 2 weeks. Do not let the soil completely dry out. In the article you said, “During the winter, when the plants go dormant, cut watering back to once every other month.” ? Hi Suzanne, This statement is for winter hardy outside succulent varieties such as hen and chicks and sedums. Generally we let Mother nature do the watering with rain and snow, but if they are in an area where they do not get natural water, give them some water occasionally so they do not freeze dry. And in the house, because of short days, the watering routine should be reduced by 1/3 of the usual. Thank you for your prompt reply. I understand now. Thank you for your question and comments!